Once, I decided that black, navy and grey were no longer going to hold my wardrobe hostage, I added a lot of color and abstract prints. Then in 2013 I introduced bold florals into my wardrobe, and I have enjoyed it ever since. With summer in full force, I ventured into mixing prints, wearing super bright colors and enjoyed the freedom it lent to my wardrobe. Talk about my dressing becoming a conversational piece is too funny, but surprised at how others look forward to seeing what I would do next. After reading A Pair & A Spare, I turned to my closet and pulled out a few floral pieces, but decided that I didn't have the right floral top and bottom to pull-off the floral mixmatch. Also, with the floral pieces I have, the color and scaling were at extreme opposites and honestly it would have been too wallpaper daring and a likely chance I'd be attacked by bees. to finish off your look add a neutral color to ground the outfit. Although I didn't pull-off a total mixmatch floral ensemble, I'm totally feelin' the flower power. Love the history of how you ventured outside your comfort zone. Great outfit! I LOVE those shoes! I'm a floral, I think 1/2 of my closet is floral. I have to make myself sew up a stripe or a solid! You look beautiful, great job on the floral mix. You are so amazing. I love following your posts because you inspire me to do more. Do you have a Pattern Review account so I can see your work there? Thank you Bonnie ! 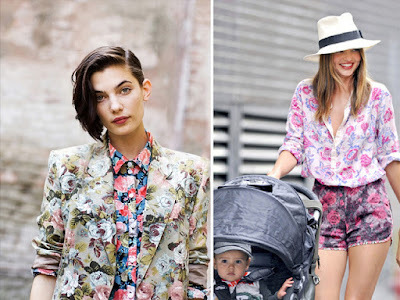 Learning that floral makes for a great mix in ones wardrobe. Beautiful, classic, bold, and traditional with a sprinklings of modern. I'm inspired by you sense of style. Thank you Tkemper ! Yes, I have a pattern reviews listed in the left side bar. Thank you Alethia ! So humbled to know I can inspire others. Great ideas Sheila - looking good! You are Welcome Tkemper and thanks for checking out my Review.